I recently ran up against a problem where I needed a dual sided power supply for an early 70s piece of equipment. The original manufacturer was out of business, and their PCB was encapsulated in potting solution. All I knew was the main board needed +18 and -18 volts, DC. This board is based on the LM340/LM320 or 78xx/79xx series regulator. 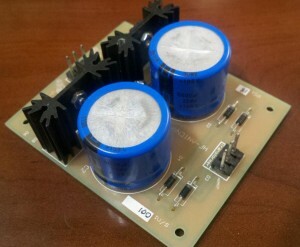 It can be constructed for +/-5, +/-6, +/-9, +/-12, +/-15, +/-18, or +/-24 volts DC. 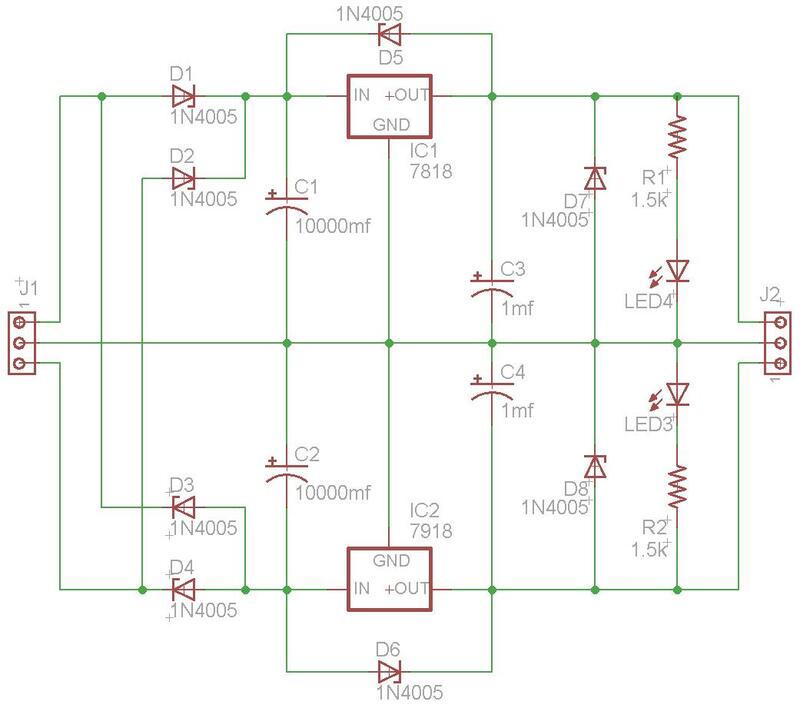 As you can see it’s a very simple design using a few diodes, three capacitors, a regulator, resistor, LED, and two connectors for the transformer connection and DC out (if you choose to use connectors). The project was designed with a slightly more expensive snap-in capacitor because I found this circuit to be very helpful not only in repairing the headphone amplifier, but also my relay switching panel for my amateur radio antenna system, a console project I have been working on, and a switching board that I’m using in our production trailer at work. The circuit is very simple and I could have breadboard it, but I decided to make up PC boards so it looked professional inside equipment. After all, people judge you by results and the quality they perceive by looks, rather than how clever you can be by using a stryrofoam McDonalds hamburger box for the PCB. The corners are marked for supporting posts, which can be drilled out for (US) 4-40 or 6-32 threads. This part list is for the dual 18 VOLT version. Modify as necessary for other voltages. The majority of the parts were found at Mouser Electronics, and can be ordered over the phone or via their web site. This entry was posted in Building and tagged 7805, 7812, 7815, 7818, 7824, 7905, 7912, 7915, 7918, 7924, LM320, LM340, negative, PCB, positive, power, supply on September 2, 2013 by Frederick Vobbe. Im grateful for the article post. Really looking forward to read more. Cool. Thank you for your kind comments! 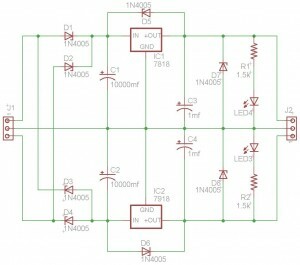 As time goes on I hope to put many circuits that I’ve designed and used both at work and at home in my hobby. Dude.. Great project. VERY useful. Really appreciate you sharing this article. Thanks Again. Really Cool. Hi there, I love this simple project, named “Dual Side Power Supply – Real Oldies Radio.com”. I would love to build this.